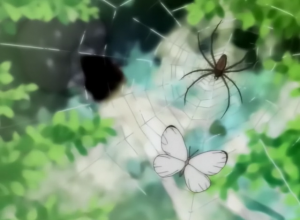 Don’t let the title fool you, Princess Tutu is great show even if you’re not a fan of anime. It uses a lot of elements and story imaginary from famous ballets and classical music. There are two slight references to Hunchback well one motif and one to Hugo. The first is to Frollo’s imagery of the fly and the spider both caught in the web (though it;s a butterfly here). While I don’t believe this imaginary to be native to Hugo but he made it well known. Though to be fair this reference comes a promo trailer for Princess Tutu which you can watch here. But moreover Princess Tutu also deals with the characters fighting cruel fates and although this contrasts with Hunchback where the characters give in to fate I thought it was worth a mention. The second reference is to the Ballet Giselle. 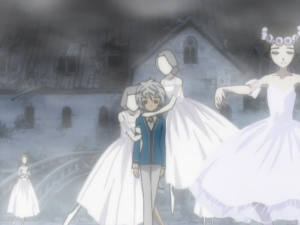 Like I said Princess Tutu uses ballets for the basis of episode’s story lines and the show does this really well. Episode 4 uses the Giselle as story reference. The story of Giselle uses Hugo’s poem Fantômes as one of its’ inspiration for the. The ghostly dancer or Willis are from Fantômes. In Fantômes a girl dances to death but if you read the poem which was published before Hunchback you would see a proto Esmeralda. For instance in the poem there is a young Spanish girl who is 15 years old and enjoys dancing. Hugo likens her to a bumblebee and she too wear s blue with spangles. I realize these references are a bit of stretch so thank you for indulging me.